Near the cultural capital of Ubud, the private and serene Villa Santai weaves the amenities of the modern world with the friendliness and grace of Balinese tradition. In a culture devoted to service and the enjoyment of life, the gentle staff promotes the unique peace and pleasure of this private villa. Villa Santai is a very private and secluded villa, yet only five kilometers east from Bali's cultural center of Ubud, with its abundance of art galleries, fine restaurants and dance performances. The villa's four romantic suites offer you spectacular views inside and out. As the villa sits high above the river valley nestled on the edge of the small village of Melayang, the sweeping views of the Petanu River Valley, ancient rice terraces and pristine jungle are breathtaking! The villa is 8000 sq. feet of private living space. More Villa Information: An infinity edge Lap Pool, reflects the the spectacular valley landscape, and is surrounded by the Poolside Terrace, the Dining and Entertainment Pavilions and Bar. On a separate Garden Level, four Guest Suites privately and graciously accommodate up to 10 guests in Suites with Private Baths, Showers, Bathrooms, Sun Decks and extensive valley views. - 2 with King Beds, Private Showers and Bathrooms, large walk in closet. - 2 with Queen Beds, Private Garden Bath, Showers, and Bathrooms, and large walk in closet. Private and personalized Spa Services, including therapeutic massages, pedicures, and manicures. Arranged en suite or in the Sitting & Massage Bale by appointment. RSI Architects International, award winning international architects and designers. And the decor throughout the villa is extraordinary with its Balinese art, antiques and fine hand-wrought details from Bali's finest artists. Trained Balinese staff of eight persons offer superior personalized service catering to your needs. They will provide a wide variety of services, including daily Western or Asian breakfast, organizing luncheon and dinner meals, arranging massage & spa treatment, etc. Guest are assured of an idyllic holiday experience. The staff endeavors to meet all of the guests vacation needs and desires to the best of their abilities. Villa Santai Manager is responsible for the overall operation of Villa Santai, including staffing, special requests and ensuring guest satisfaction. Guests can reach our English speaking manager 24 hours a day. Villa Santai has developed a wonderful in-house menu of the quality of a fine restaurant. We are also accustomed to making arrangements for dinner parties, weddings, and other events. We offer catering services as well. Our staff is very capable in decoration, especially in flower arrangements. Our Villa Attendants are responsible for maintaining high-standards of cleanliness and tidiness at Villa Santai. They are also on hand to aid the Chefs in the preparation and serving of guest meals. The chauffeur is on standby for guests up to ten consecutive hours every day. There is no charge for the driver, but if the vehicle is used there will be a charge of $45 per day plus petrol. Additional vehicles and drivers can be arranged if necessary. Please let us know of any specific requirements in your booking request. The Villa is guarded by Daily 24-Hour Security at all times. Villa Santai prides itself on superb dining services, provided by our house Chef, assistant cook, and staff members. You may choose from an extensive menu of both Eastern & Western cuisine. Our assistant chef will visit the market after your food selection has been made and will purchase the food required. Food and beverage shopping is conducted on a daily basis. There are mini-bar refrigerators in each bedroom, one larger refrigerator in the bar area and one large in the kitchen. Stoves tops in the main kitchen. We have a chef with 8 staff members at your disposal. All meals available from 7:00AM - 10PM. The villa's driver, Wayan promptly picked us up from our hotel in Nussa Dua for tranfser to Villa Santai. This service was complimentary. Wayan was friendly, answered many of our questions and was available for other transports throughout our three night stay. The villa is set on within an area of rice fields, but sits on the hillside of a rainforest with a running river below. The open air lounging, dining and swimming area sits on the top level with the four bedrooms located on the lower level. There is a bar, large dining table, two lounge type areas with sofa type seating, two separate "palapas", along with a nice bathroom on this top level. This is also where the infinity pool which overlooks the greenery of the rain forest, is located. The bedrooms are surrounded by open views, protected with screens that allow for the most inspiring views. At night, the staff, draws the curtains, turns down the beds and cools off your room with ceiling fan and air conditioning unit. The background to your sleep is the sound of the river flowing and various nature sounds like crickets humming and roosters crowing in the morning. The bathrooms feature either a shower or bathtub with double sinks and toilets. The staff were all very friendly, honest and eager to help us with whatever we requested. The food was good, with breakfast included in nightly rate, but other meals were charged according to the villas "menu" prices (reasonably priced). We did bring our own snacks and beverages which w purchased at the local supermarket, and this was not a problem. They do have all types of drinks available, but again, at menu pricing. We did have the most delicious fresh squeezed drinks every day with breakfast, and then again upon return from outings. These juices were also complimentary and a very nice touch, as were the cold cloths provided each time we returned from outings that allowed us a quick freshen-up. The "compound" was kept very clean and well supplied. We were also able to have some of our clothing laundered for a modest price. We had plenty of special touches that felt like we were staying in a nice resort. The villa had fresh flowers in all the rooms and common areas. Upon our arrival, there was special flower accents along the entire entry pathway along with some fresh hanging decorations, which really provided an authentic touch. We had plenty of fresh beach towels available every day, bottled water, and plenty of ice. Bellissima casa e location, ottima per il relax e il contatto con la natura. Per chi vuole una vacanza tranquilla in un contesto estetico unico. Personale gentilissimo e disponibile, tra le tante cose belle e comode l'unico miglioramento che suggerisco è di mettere i vetri nelle camere, per il rumore (soprattutto quando piove) e l'umidità. You must stay in Villa Santai! It is Beautiful! 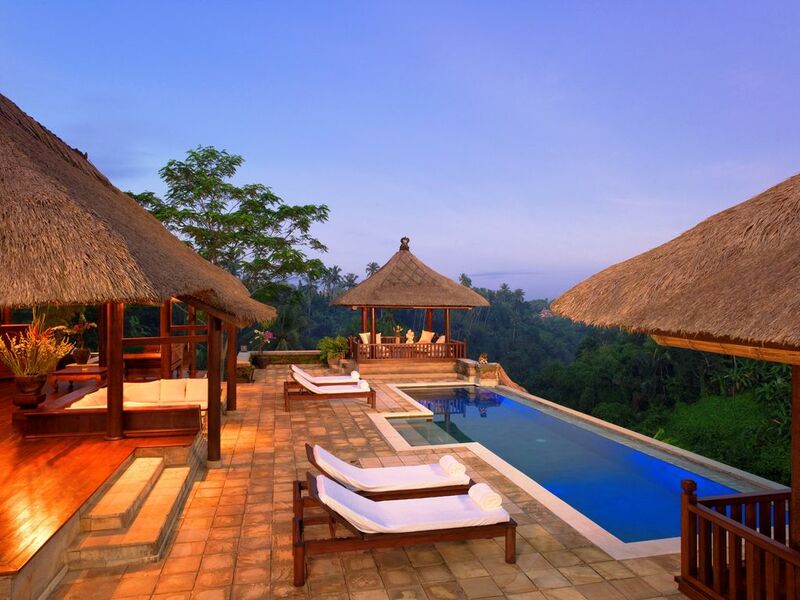 Villa Santai is an absolutely gorgeous place and I recommend it to anyone that wants to visit Ubud, Bali. Perfect for a family, a group of friends or a couple on a romantic getaway. The scenery of the forest in the backyard is breathtaking. You can even hear the sounds of the river valley. Going for a dip in the pool while looking at the view is truly relaxing. The staff at Villa Santai are very courteous and hospitable. Whatever I needed, whether it was booking a massage or making a reservation at a restaurant, they made sure to set it up for me. The food that the chef makes is delicious. It's very convenient that there is a driver provided by the Villa because it is a very short drive up the mountain from Ubud village. It's nice to get away from the hustle and bustle of the busy village and then have a peaceful evening back at the Villa where there is a kind staff waiting. There is a security guard that stays there at night so I always felt safe and secure. I liked staying there so much that I ended up extending my stay...I was not ready to leave! Don't be surprised if you feel that same when you're there. I highly recommend this gorgeous, serene place. The villa's four romantic suites offer you spectacular views inside and out. As the villa sits high above the river valley nestled on the edge of the small village of Melayang, the sweeping views of the Petanu River Valley, ancient rice terraces and pristine jungle are breathtaking!